June 9, 2010 — Reversing three consecutive years of declines, overall customer satisfaction with airlines in North America has increased notably, with 10 of 12 airlines improving from 2009, according to the J.D. 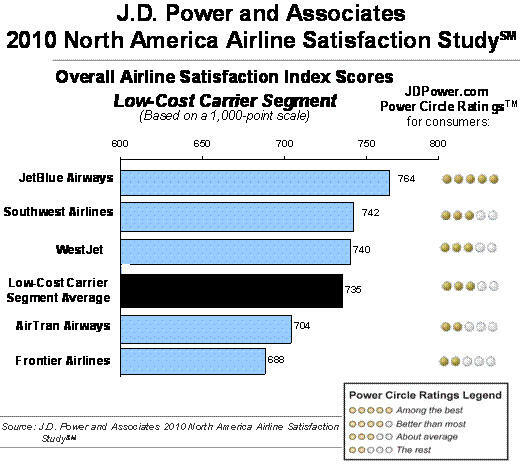 Power and Associates 2010 North America Airline Satisfaction StudySM released on Tuesday. “The fact that overall satisfaction with airlines has improved is particularly notable in light of a difficult economic year, in which add-on fees have continued to proliferate and two major airlines have merged,” said Stuart Greif, vice president and general manager of the global travel and hospitality practice at J.D. Power and Associates. The study finds that overall customer satisfaction with airlines in 2010 has improved to a three-year high of 673 on a 1,000-point scale, improving by 15 points from 2009. The improvement is driven by increases in satisfaction with cost and fees and in-flight services in 2010, compared with 2009. According to Greif, many of the same macroeconomic conditions that adversely impact airlines financially—including lower fares—have led to improvements in satisfaction. For example, with fewer passengers traveling and fewer flights in the air, on-time performance has improved. As more airlines charge fees for checking bags, fewer passengers are choosing to do so, thus reducing the number of baggage issues and complaints. The study findings also suggest that while passengers may dislike add-on fees, they are gradually starting to accept them. In turn, those fees may be having a less pronounced impact on satisfaction as passengers recalibrate their expectations. However, as the economy gradually recovers, airfares are beginning to rise and more travelers are returning to the skies. “The question is whether airlines will take the necessary steps to improve the passenger experience and build commitment before rising prices and increased passenger traffic negate those efforts.” said Greif. The study measures overall customer satisfaction based on performance in seven measures (in order of importance): cost and fees; flight crew; in-flight services; aircraft; boarding/deplaning/baggage; check-in; and reservation. Carriers are ranked in two segments: traditional network and low-cost. Traditional network carriers are defined as airlines that operate multi-cabin aircraft and use multiple airport hubs, while low-cost carriers are airlines that operate single-cabin aircraft with typically lower fares. Alaska Airlines ranks highest in the traditional network carrier segment for a third consecutive year and performs particularly well in six of the seven measures: flight crew; aircraft; boarding/deplaning/baggage; check-in; cost and fees; and reservation. Continental Airlines and American Airlines, respectively, follow Alaska Airlines in the rankings. Continental Airlines performs particularly well in the in-flight services measure. 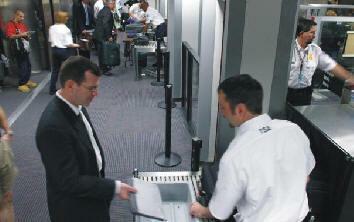 For a fifth consecutive year, JetBlue Airways ranks highest in the low-cost carrier segment. JetBlue Airways performs particularly well in two of the seven measures: aircraft and in-flight services. Following JetBlue in the segment rankings are Southwest Airlines and WestJet, respectively. Southwest Airlines performs particularly well in the cost and fees and reservation measures. WestJet performs particularly well in the check-in; boarding/deplaning/baggage; and flight crew measures. • Overall, among customers who are assigned to a middle seat, satisfaction averages 16 points lower than among customers in a window or aisle seat. This impact is magnified among members of frequent flyer programs of traditional network carriers, as satisfaction among these passengers falls to 20 points below the segment average. In comparison, among non-members of frequent flyer programs who are assigned to a middle seat, satisfaction decreases to just two points below the segment average. • Among passengers of traditional network carriers, 65 percent indicate that complimentary meals are the in-flight amenity they would most like to have. Approximately 56 percent of passengers of low-cost carriers say the same. • Nearly one-half of passengers say that prices for in-flight beverages and food; checked baggage; and preferred seating are unreasonably high. • On average, three in five airline passengers check baggage. Satisfaction with boarding, deplaning and baggage averages nearly 60 points higher among passengers who are not charged for the first checked bag, compared with those who are charged for the first bag (765 vs. 702, respectively). The 2010 North America Airline Satisfaction Study measures customer satisfaction of both business and leisure passengers with major North American carriers. The study is based on responses from more than 12,300 passengers who flew on a major North American airline between April 2009 and April 2010. The study was fielded between May 2009 and April 2010. J.D. Power and Associates is a global marketing information services company operating in key business sectors including market research, forecasting, performance improvement, Web intelligence and customer satisfaction. The company’s quality and satisfaction measurements are based on responses from millions of consumers annually. For more information on car reviews and ratings, car insurance, health insurance, cell phone ratings, and more, please visit JDPower.com. J.D. Power and Associates is a business unit of The McGraw-Hill Companies.